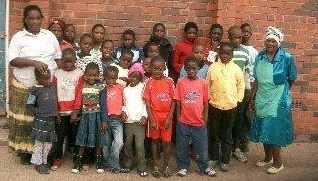 In March I was fortunate to visit Bulawayo to stay with Mike & Judy Carter and to catch up with the 45 children at school in the Pelandaba area this year. I was hoping to increase the numbers again, but am erring on the side of caution after discussion with Mike and Sandra and since the devaluation of the pound against the dollar. I'm now having to raise about £10,000 a year to maintain the status quo. Hopefully the money situation will level out and we will then put another 5 children into school. This will happen if the currency situation stablelises in Zimbabwe as well. It has been a very busy year event wise, spreading locations so that we are introducing the charity to a wider audience. People continue to be generous and we get a great response at all events. Thank you to all those who hold events for the charity, it is greatly appreciated. I continue to work in the school around Argyll and Bute and the children respond enthusiastically. It's wonderful when children get involved raising funds for other children less fortunate than themselves and hopefully raises a lifelong awareness of the predicament of others. There are already plans in the pipeline for next year and so we should be able to maintain support for the orphans education. While visiting Pelandaba, I was struck and humbled by the genuine appreciation and determination of the pupils to do well and make the most of the opportunity given to them. They all realise that that eduaction is the only way forward and really want to do well for themselves, for those who support them and so they can make a difference later. Many of you deserve thanks for your continuing support as I could not sustain the charity on events alone. Some of the regular suscribers have requested to remain anonymous, so I thank them as well as The Zoe Carss Education Foundation, Mr. Hayes & the Drs' Pollock for their generous contributions throughout the year. A special thanks must go to Mike, Judy & Sandra who work tirelessly to improve conditions in Bulawayo and who ensure the fees are paid each term. Without them the charity could not function. Thank you to Tom Benyon and ZANE who claim gift aid for the charity and facilitate the sending of funds to Mike. I attended a meeting of ZANE while in Buawayo and as usual was amazed at their commitment to making life easier for many people in Zimbabwe. Conditions, as I'm sure many of you are aware are at crisis level again in Zimbabwe and the ordinary people are suffering a great deal. Mike Carter is a senator in the MDC opposition, a very brave man, who is doing what he can to try and change the situation from within. We all hope there is a solution in the not too distant future and will continue to do what we can from our safer environment!